Shiny hair is something that most women dream of. 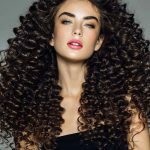 Whether you have hair that is curly or straight, or short or long, wanting shiny hair is most likely the biggest part of your dream hair checklist. That is why you will be happy to know that no matter what your hair type is, shiny hair is attainable as long as you put in the right amount of care. Taking care of your hair does not necessarily mean spending bucket loads of money on products that may or may not work for your hair. Instead, it can be as simple as utilizing natural ingredients that are known to work wonders for your hair. The best part about using natural ingredients is that almost all of them are readily available, and it is likely that they’re already in your kitchen. 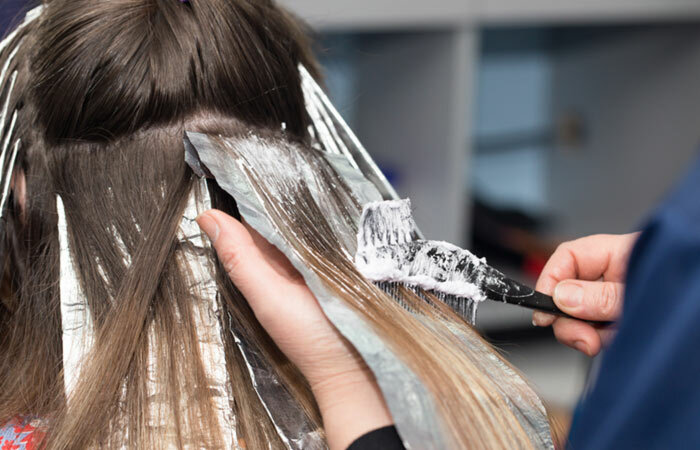 Below, we have put together the many different ways in which you can get shiny hair without having to step out of your house. Can A Flat Iron Make Your Hair Shiny? If oiling your hair wasn’t already a part of your hair care routine, it’s about time you made it. Oils help soothe your scalp, nourish and moisturize your hair, and help increase blood circulation when you massage it into your scalp. Hair that is well-nourished and moisturized has healthy cuticles that lie flat, making your hair look shiny. Following is a list of the different oils you can use to improve the health of your hair and the different ways in which you can use them. Coconut oil is one of the most popular ingredients in hair care and for good reason. The oil is rich in medium fatty chain acids and has antimicrobial properties that make it an effective solution for nourishing your hair while maintaining scalp health (1). It is one of the most penetrative oils, which allows it to be seeped right into your hair shaft, nourishing it (2). It smooths down your hair cuticle, preventing protein and moisture loss by forming a protective barrier around your hair shaft. While coconut oil can be used in a hot oil treatment, or applied as a deep conditioner, another popular method of use is as an oil rinse. An oil rinse is not only quick, but it also helps keep your hair conditioned for extended periods of time. It keeps your hair protected from factors like moisture loss and the harmful effects of the sun. The oil coats your hair while not weighing it down, ensuring that your cuticles remain unharmed by the sun or a dehydrating environment. In case you have a sensitive scalp, coconut oil as a rinse also helps keep it soothed and cool. Detangle your hair and then wash it with your usual shampoo. Rinse the shampoo out of your hair and squeeze out any excess water. 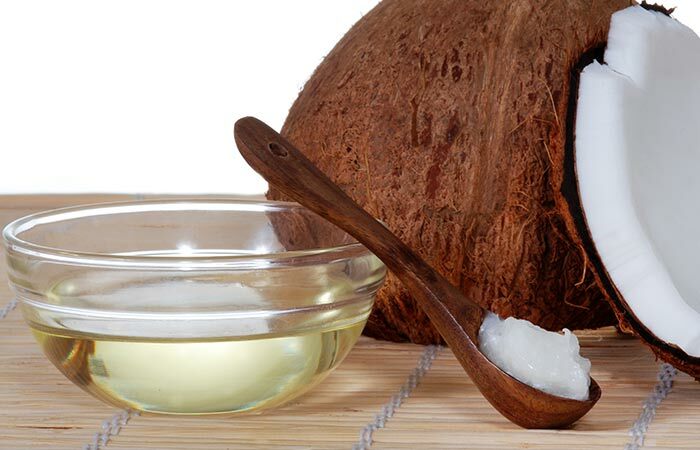 Take two tablespoons of coconut oil and slowly coat your damp hair with it. Ensure that you coat all of your hair. Concentrate on the tips. Apply your conditioner on top of the oil. Let this sit for 5 minutes while you soap up or shave. Rinse the conditioner and oil out of your hair and let your hair air-dry. You can do this up to three times a week or every time you wash your hair. 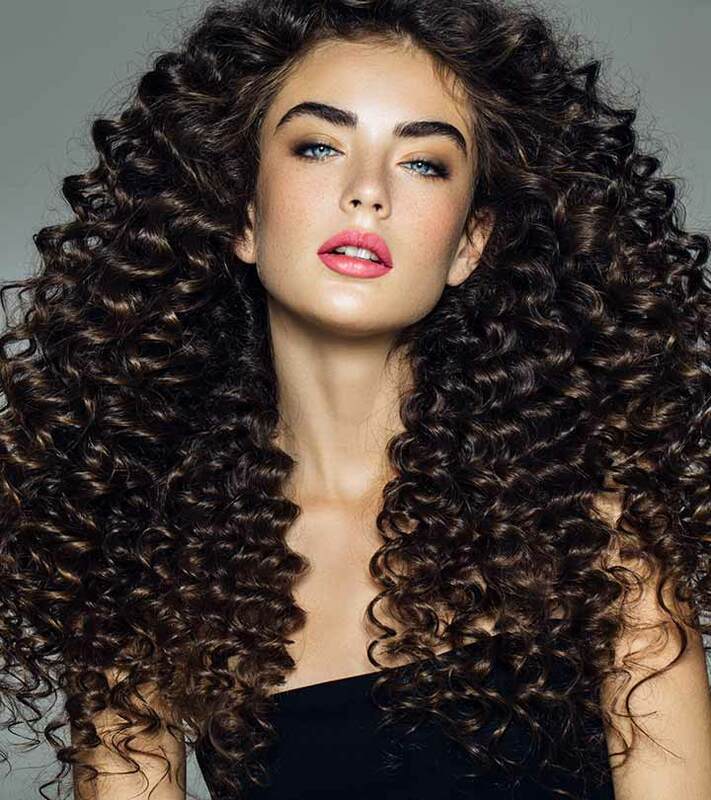 You will start to notice that your hair is less prone to frizzing and is softer to touch. However, this isn’t an ideal solution for people with oily hair as the rinse may end up making your hair greasy. 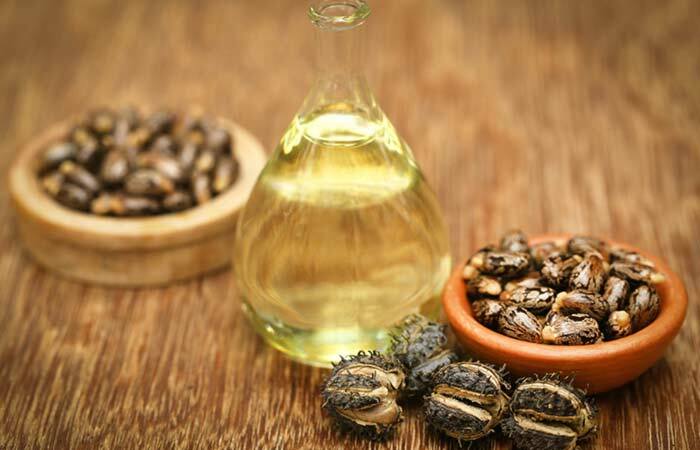 Castor oil is popularly used to promote thick hair growth, but not many are aware of its emollient properties (3). An emollient is something that retains moisture and seals it into your hair. 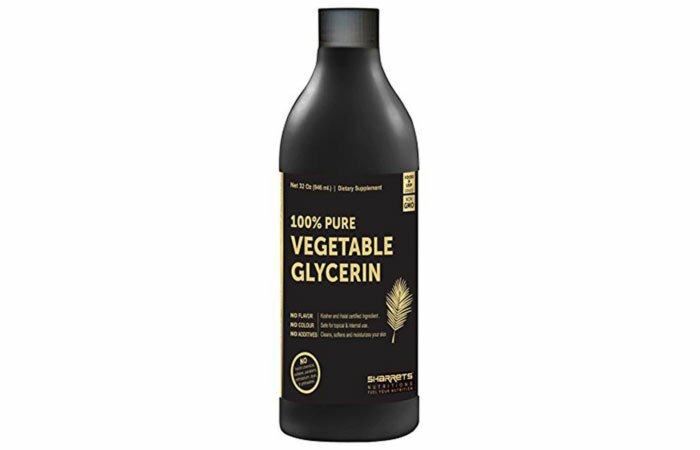 The stickiness of this oil makes it perfect for sealing moisture. Its high protein content allows it to fill out the damaged keratin spots in your hair, making your hair smooth, shiny, and less prone to frizz. However, the thick nature of castor oil makes it hard to handle while applying it to your hair. Using it in combination with coconut oil solves this problem. This combination of castor and coconut oil is an effective solution to get shiny hair. Mix one tablespoon of castor oil to two tablespoons of coconut oil. Massage it into your scalp to promote hair growth and also concentrate on the ends to minimize splitting. Apply this mixture to dry hair before you go to bed. Shampoo and wash off the oils from your hair the next morning. You can do this up to 2 times a week. You will notice that your hair is softer and less frizzy after the first few times. As the health of your hair improves, it will also become smoother and shinier. 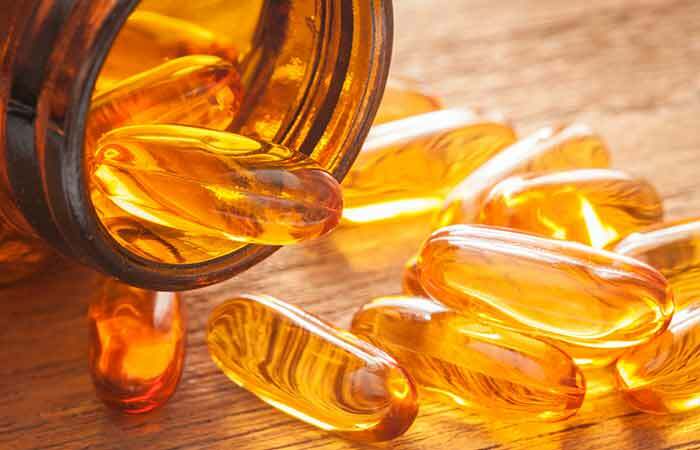 Fish oil is known for its ability to nourish your hair follicle with its rich omega-3 fatty acids content. These fatty acids are essential for healthy hair growth, optimum consumption of which ensures that your hair grows out to be healthy and strong. However, you can also apply the oil directly to your hair. Undernourished hair tends to lack luster and shine and is more likely to get damaged and break off. Adding fish oil to your hair care regimen will tackle this problem and replenish your hair with the essential nutrients needed to maintain its health. Olive oil works as a good carrier oil because of its conditioning properties. A lot of people hesitate to use fish oil because of its odor. However, there are brands like Nature’s Bounty that sell odorless fish oil. Use fish oil once a week and after a couple of uses, you will notice that your hair is softer, shinier, and much more manageable than before. People with fine or oily hair can also use this as these oils do not weigh your hair down. This oil is perfect for people with oily scalps and fine hair. The oil is actually a wax ester, which mimics the structure of the natural oil produced in your scalp. 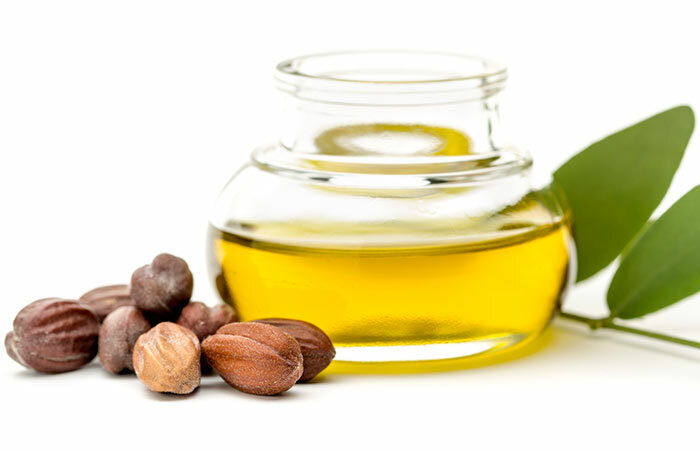 Jojoba oil is rich in omega 6 and 9 fatty acids and antioxidants. The fatty acids nourish your hair while the antioxidants fight damage-causing free radicals. Since the oil is so similar to the natural oil produced in your hair, it coats your hair and keeps it hydrated. This helps it smooth down the cuticles on your hair shaft, making your hair silky and shiny. You could also add a few drops of jojoba oil to your shampoo and conditioner if you have dry hair. Since jojoba oil doesn’t weigh your hair down, you can also use it as a leave-in conditioner by rubbing a few drops of it into your hair. This will smooth down your hair and add shine. Lavender oil has a pleasant scent and is used in aromatherapy. It also has properties that add shine to your hair. It is often used in hair care products because of its antibacterial properties that help to maintain scalp health (4). When used in combination with other oils, it reduces dandruff and effectively conditions your hair. A small amount of lavender essential oil is sufficient to condition your hair. It works effectively when used in combination with a good carrier oil. Do this at least once a week to notice visible results. Not only will this hot oil treatment moisturize your hair and leave it shining but will also leave your hair smelling heavenly. Rosemary oil helps your hair retain moisture, keeping it soft, healthy, and shiny. It is used to treat a lot of different issues of the hair such as hair fall, infections of the scalp, and dry hair. It is also known to improve the circulation of blood in your scalp, which allows for efficient absorption of nutrients and healthy hair growth. 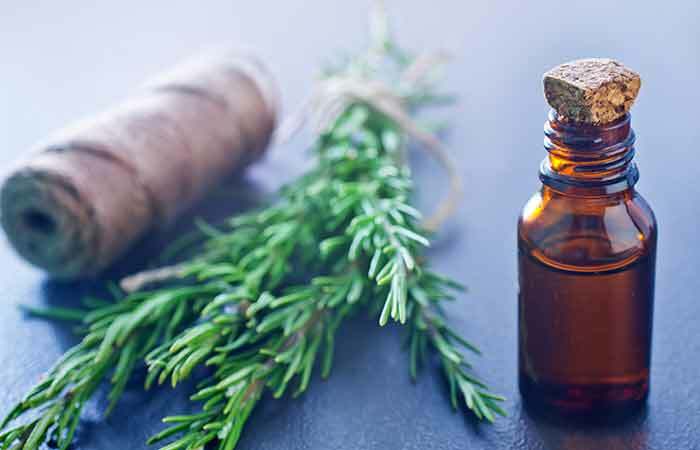 You can use rosemary essential oil in combination with other carrier oils such as coconut, olive, or almond. It can be used as a hot oil treatment, a leave-in treatment, or a leave-in conditioning serum. Ensure that you do not use too much of this mixture or your hair may feel weighed down. If you ever feel your hair drying out or frizzing up, rub a few drops of the mixture in between your palms and run it through your hair to smooth it down and add shine. This amazing hair care ingredient has its roots in Australia, where it was used to treat boils, burns, and cuts. It has only recently become a favorite hair care ingredient. Its antibacterial and antifungal properties make it an effective solution for maintaining scalp health (5). When used in combination with a carrier oil, it moisturizes your hair, soothes your scalp, and minimizes dandruff. The health of your scalp greatly determines how nourished your hair is. A scalp that is irritated will not secrete enough sebum, and in the process, make your hair dry and lifeless. Tea tree oil solves this problem by improving the health of your scalp. Use this hot oil treatment once a week for a healthy scalp that produces enough sebum to nourish and maintain your hair. Using a hair pack at least once a week will show you immediate results and add instant shine to your hair. Below, we have listed nine hair packs that add luster to your hair, making it glow with health. How To Use A Hair Pack? Mix your hair pack and ensure that there are no lumps in it. Wash your hair without using a conditioner and let it air dry. Evenly coat your hair with the hair pack. Let it sit for 30-45 minutes. Eggs are packed with protein, which is what your hair is made up of (6). Using an egg pack will add instant shine to your hair while nourishing it and increasing its tensile strength. To make a simple egg hair pack for shiny hair, you will need one egg, two teaspoons of honey, and one teaspoon of almond oil. If your hair is extremely long, you can double the amount of ingredients that you are using. Bananas are rich in Vitamins A, B, C, and E, which makes it a perfect ingredient to fix damaged hair (7). These vitamins help nourish your hair while adding shine, and make your hair much softer and manageable. Making a banana hair pack at home is easy. 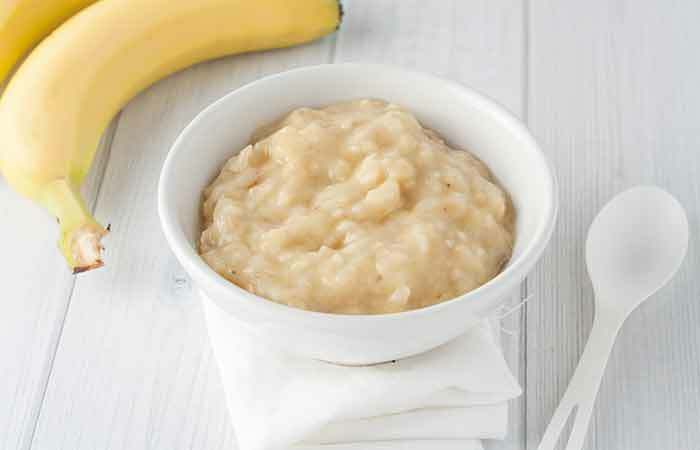 Just get a ripe banana, mash it, and apply it to your hair. Optionally, for extra conditioning, you can add a teaspoon of your favorite hair oil, such as almond or coconut. 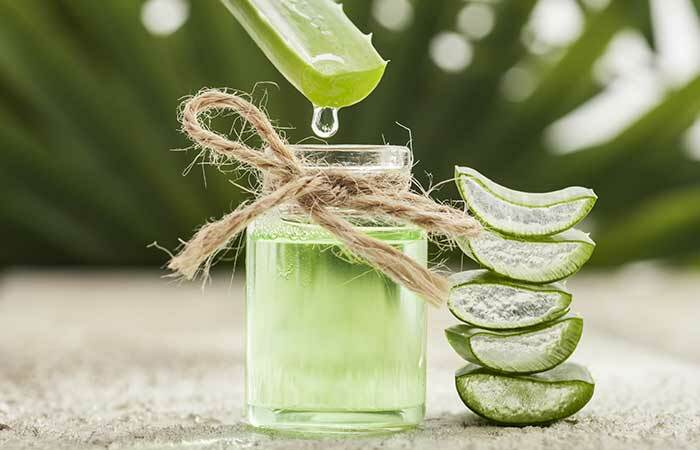 Since aloe vera is 95% water, it is extremely hydrating, which makes it the perfect ingredient for hair care (8). It has been used in hair care for a long time as an ingredient that battles dandruff, moisturizes, and boosts hair growth. To use aloe vera in a hair pack, extract 1 cup fresh aloe vera gel from the plant. To this, add a tablespoon of castor oil, which is an ingredient known to control frizz. Apply this mixture to your hair. You can leave it on for 45 minutes or even overnight. Avocados are rich in fatty oils and Vitamins A, B, and E, which are excellent hair nourishing nutrients. They also increase the levels of collagen in your body (9). Collagen is essential for healthy hair growth, and it also repairs damaged hair and reduces splitting. The damage reversal improves the health of your hair shaft, adding shine. 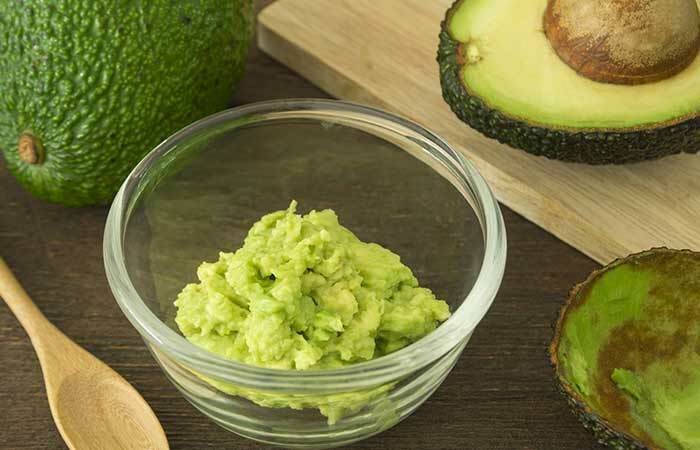 For an avocado hair pack, all your need to do is mash enough of it to coat the entire length of your hair. 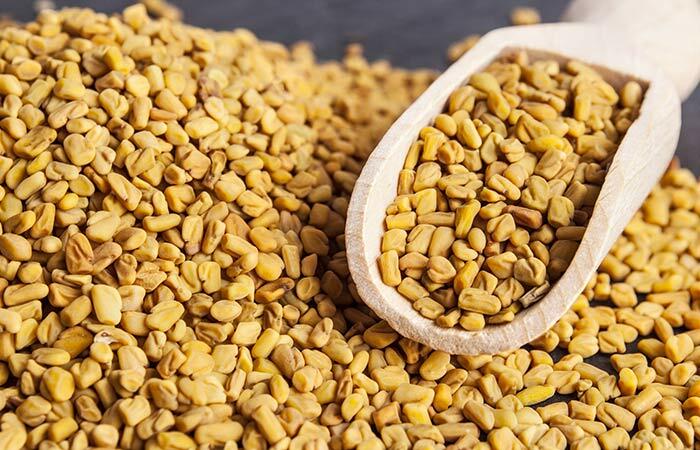 Fenugreek seeds are rich in antioxidants and have moisturizing properties (10). They leave your hair feeling soft as the antioxidants neutralize the damaging free radicals present in your hair. Hair that is healthy and moisturized is bound to be shiny. To use fenugreek seeds in a hair pack, take two tablespoons of fenugreek and grind them into a fine powder. Mix this powder in a cup of milk. 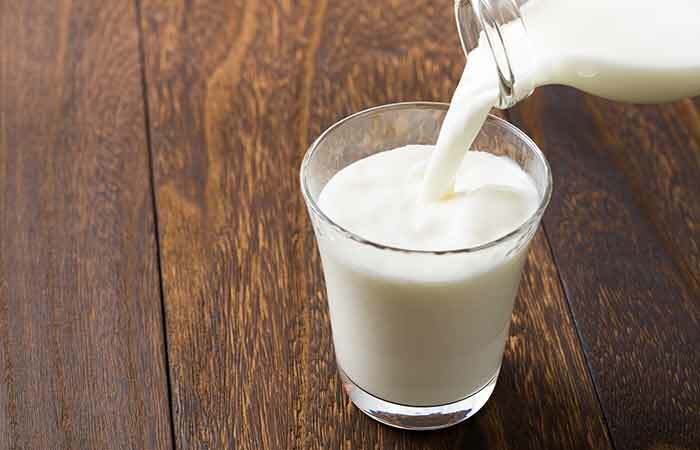 Coat your hair from roots to tips with this milk and leave it on for 20 minutes. 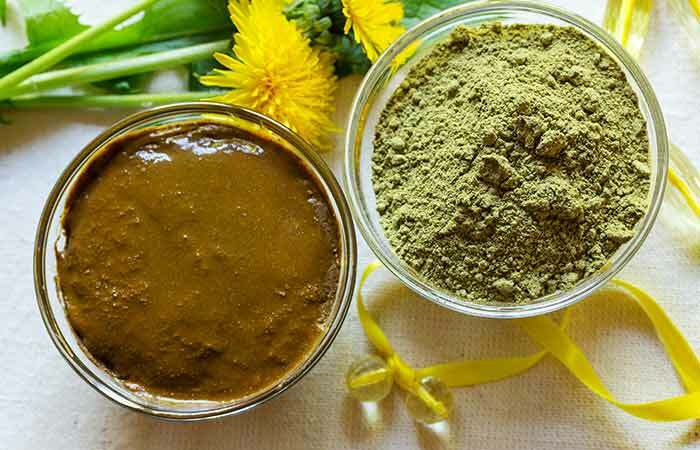 Henna is not only used as a dye but has also been historically used as a conditioner for hair (11). It has antibacterial and antimicrobial properties that maintain your scalp health. Henna adds a deep red color to your hair, and so is the perfect ingredient to use for shine if you are someone who loves playing with colors. To use a henna hair pack, combine pure henna powder with water. Add enough water to get a thick pasty consistency. Apply the mixture to your hair and let it sit for 45 minutes to an hour. 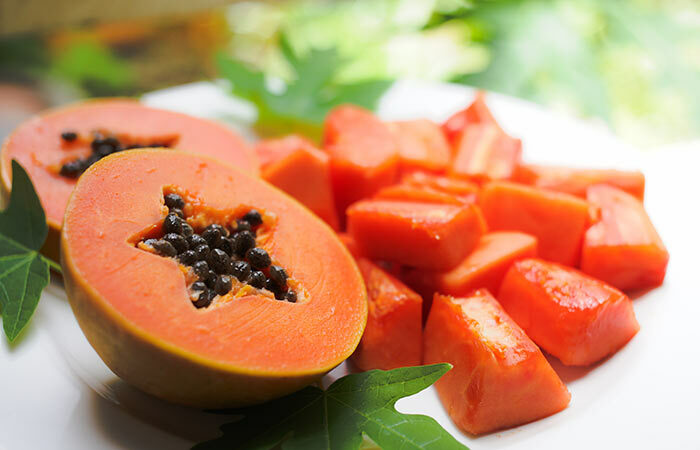 Papayas have the ability to make damaged hair shiny, smooth, and manageable. A lot of commercial hair products mention that they contain the goodness of papaya. This is because the fruit has been in use for a long time as a hair care remedy that fixes hair damage and encourages re-growth. To use papaya in a hair pack, peel and seed the papaya. Blend enough of it to give you 1 cup of puréed papaya. To this, add half a cup of yogurt. Apply this to your hair and leave it in for 30 minutes. Yogurt is rich in Vitamins B5, D, and proteins (12). It is used in many hair packs to hydrate and add instant shine. It is also rich in lactic acids that cleanse your scalp and minimize issues such as dandruff. 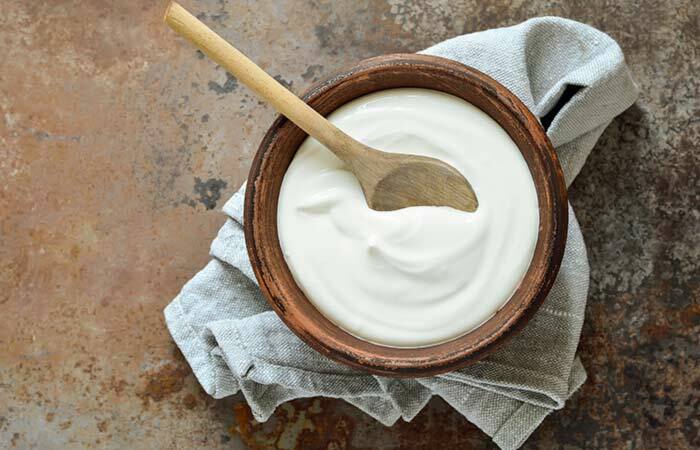 To use yogurt in a hair pack, add a tablespoon of honey, and one teaspoon of lemon juice to one cup of yogurt. Apply this to your hair and let it sit for 30-45 minutes. Teas are commonly used as a final rinse to add shine to your hair. They are rich in antioxidants and vitamins that make your hair soft and smooth. But before we get into the list of teas that work well as a hair rinse for shiny hair, let’s talk about how to rinse your hair with tea. Following is a list of three teas that add shine to your hair. If you’ve been planning on getting highlights but are hesitant because you don’t want to damage your hair, a chamomile tea hair rinse is just the thing for you. 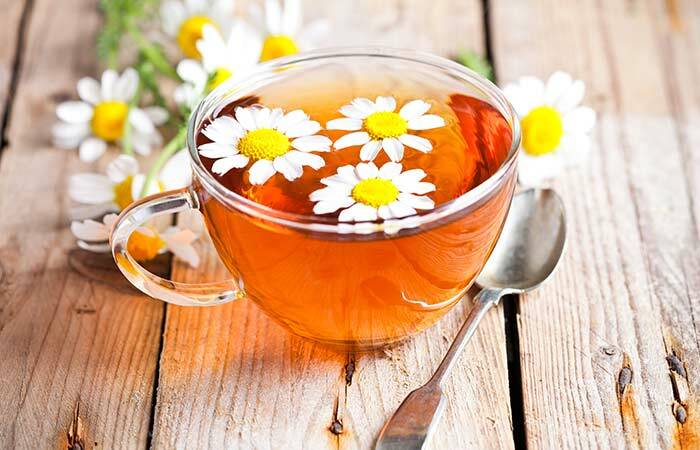 Chamomile tea has lightening agents that will add some natural highlights to your hair while its rich antioxidant content will leave your hair feeling soft. On the other hand, if you want to darken your hair color, black tea is the hair rinse for you. 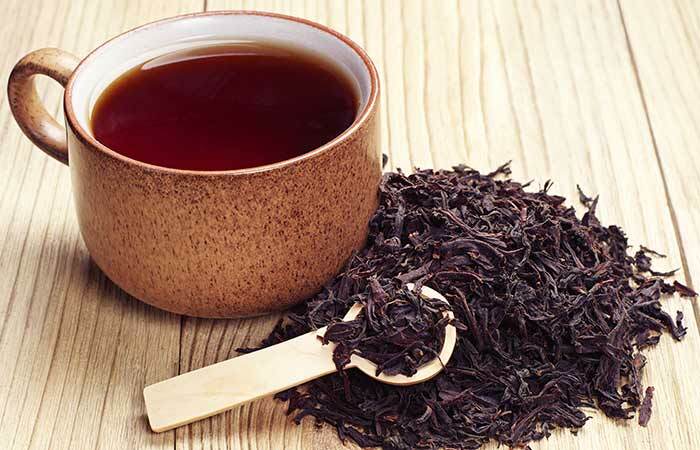 Black tea prevents hair loss while darkening your hair and adding shine. Its high antioxidant content will make your hair stronger, while minimizing damage. 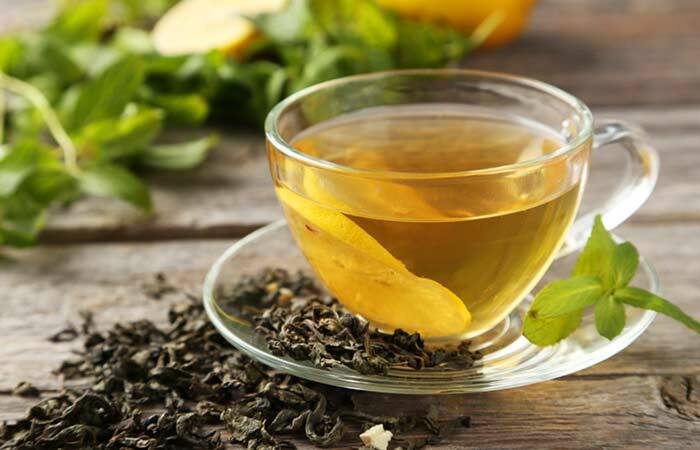 Green tea is one of the most popular teas that are known for their high antioxidant content. It is known to reduce hair fall, stimulate hair growth, and add luster. It also consists of amino acids and panthenol, both of which are essential for healthy hair growth. Hair rinses are becoming popular as a means to clarify while adding shine. 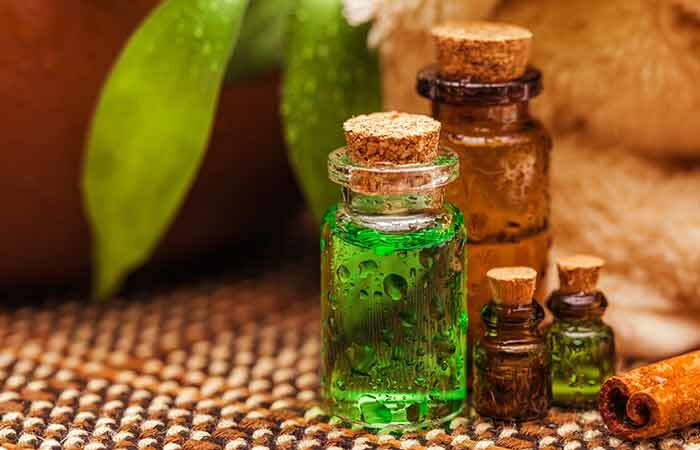 There are many ingredients that you can use in a hair rinse, all of which serve different purposes with the end goal of attaining hair that shines with health. Following is a list of the various kinds of hair rinses that are known to add shine to your hair. 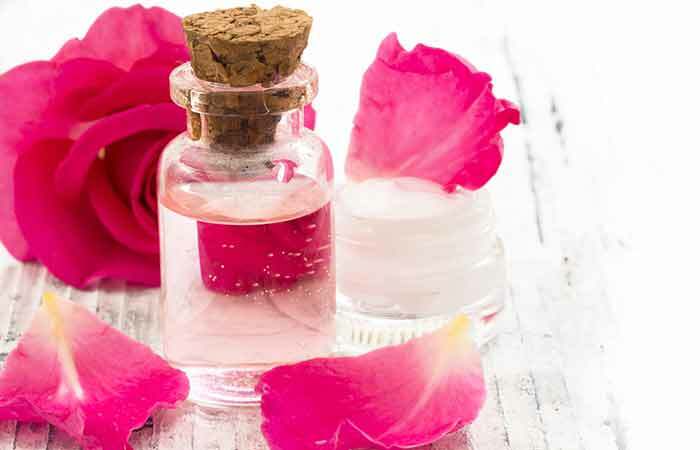 Rose water has been used in skin and hair care for the longest time because of its refreshing nature. This, added to its antiseptic properties that soothe your scalp, make it the perfect moisturizing hair rinse (13). It is also one of the most budget friendly hair treatments. Use 2 cups of cool rose water as a final rinse after you shampoo and condition your hair to keep your hair soft and moisturized. A lot of commercial shampoos and conditioners now incorporate beer as one of their main ingredients. 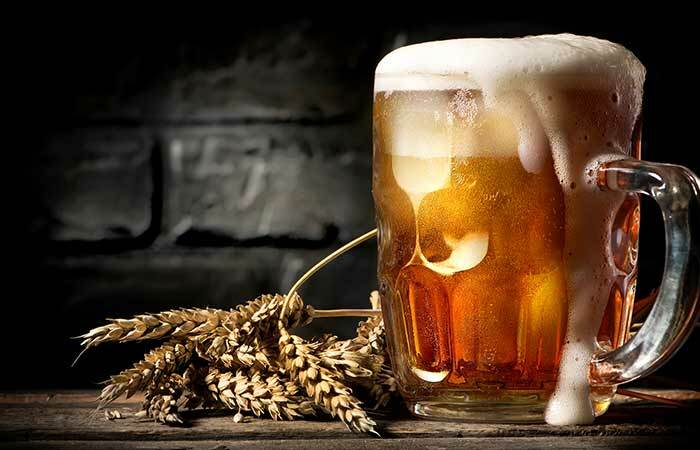 This is because beer’s basic ingredients, malt and hops, are rich in proteins that coat your hair and nourish them, leaving your tresses looking radiant and feeling soft. To use beer as a hair rinse, pour two cups of beer into a jug and let it sit overnight until it goes flat. Shampoo your hair and then pour the beer through it. Massage your hair for a couple of minutes and then rinse it out with cool or lukewarm water. Honey is a known humectant and emollient, which means that it locks the moisture in your hair shaft, keeping it hydrated. It also encourages antioxidant activity, keeping your hair damage-free (14). 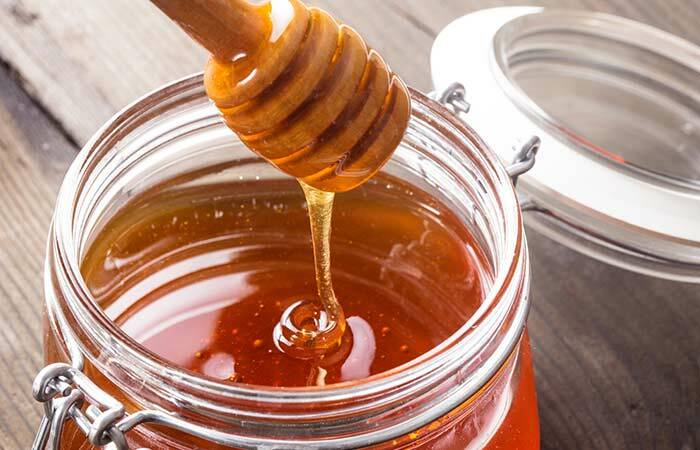 To use honey as a rinse, mix one tablespoon of raw honey to two cups of water. Use this as a final rinse after you shampoo and condition your hair. This antiseptic drink is fantastic for your hair. 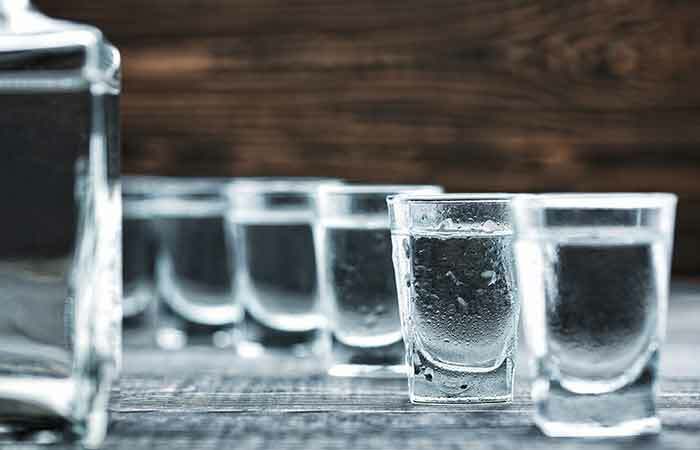 Vodka is one of the most popular ingredients for homemade beauty remedies in Russia, and that’s where the idea of using it in a hair rinse comes from. Add one tablespoon of vodka to two cups of water and use this as a final rinse to leave your smooth, frizz-free, and shining. Use this rinse once a month to clarify product build up and keep your locks healthy. 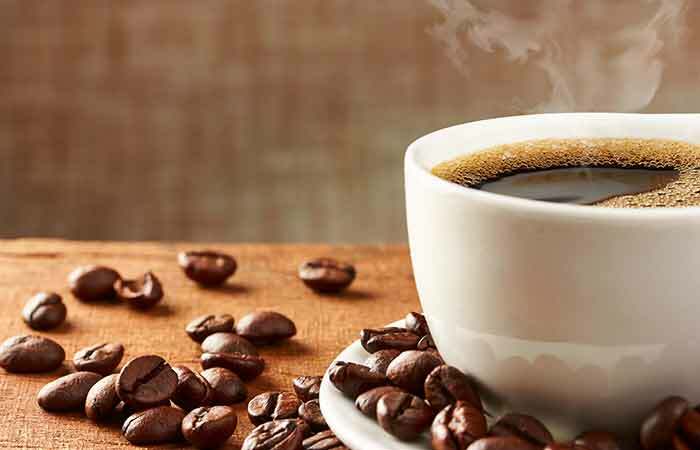 This is the perfect rinse for coffee lovers and people who love the smell of coffee. If you are a brunette, a coffee rinse can enrich your hair color, making it look lustrous and fabulous. However, if you have light hair and don’t want the coffee to stain your hair, this might not be the best option for you. Use two cups of brewed black coffee that has been cooled as a final rinse to leave your locks shining and smelling wonderful. 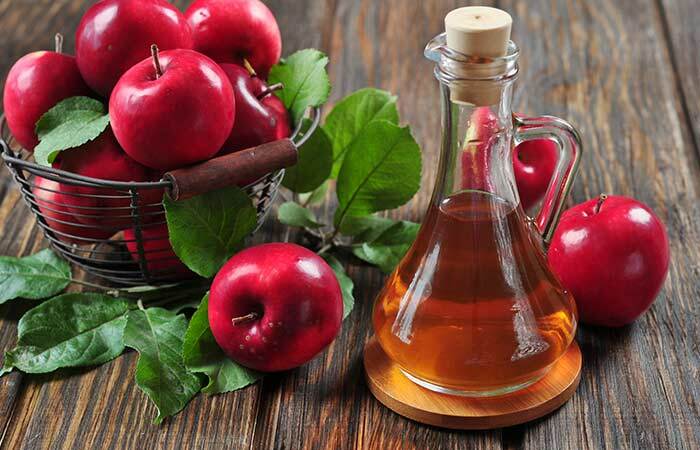 Apple cider vinegar is popularly used as a clarifying hair rinse. It removes the build up of dirt and product, giving you soft and shiny hair. However, using this more than once a month can dry out your hair. To make the rinse, add two tablespoons of ACV to two cups of water. 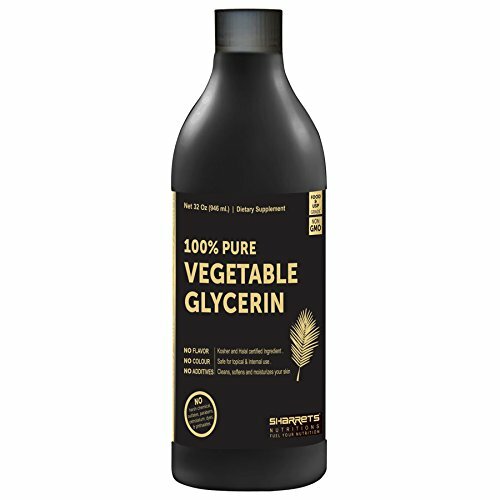 Using a vegetable glycerin based hair spritz can do wonders for your hair. Not only does this add shine to your hair but it also makes it easy to detangle and manage. Combine vegetable glycerin, water, and a fragrant essential oil of your choice in a spray bottle to make the perfect rejuvenating hair spritz. 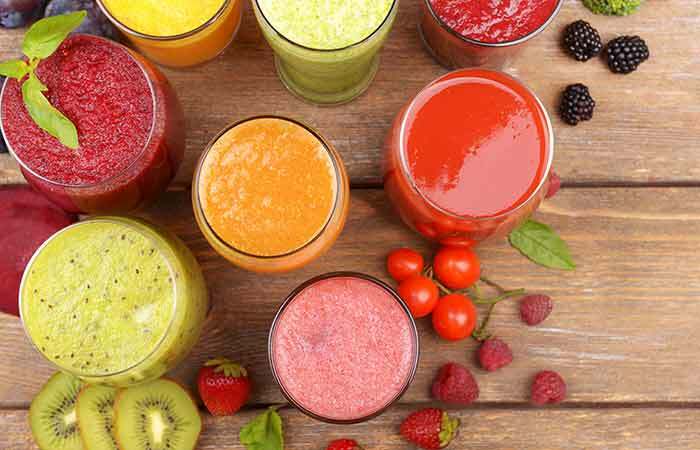 Consuming raw juices made from guava, garlic, coriander, carrots, aloe vera, and strawberries can go a long way in improving the health of your hair and giving you lustrous and glossy locks. 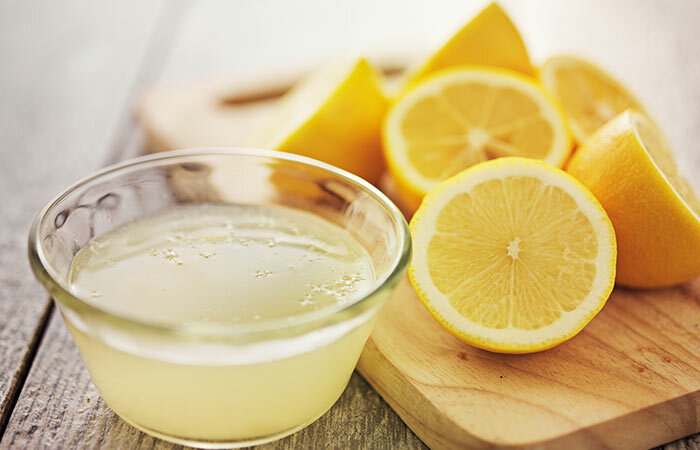 Adding lemon as an ingredient in a hair pack or using it as a rinse can give you shiny hair instantly. This is because of its high antioxidant content combined with its ability to boost collagen production. Add one tablespoon of lemon juice to two cups of water to use it as a hair rinse. Using a conditioning leave-in serum will keep your hair moisturized and feeling smooth. This is because serums usually contain silicones that coat your hair, locking the moisture and creating a smooth surface, making it more manageable. Using plain milk as a hair pack can work miracles on your hair. It is a strong conditioner that also has straightening properties. To use milk as a hair mask, simply massage a cup of milk into your hair and let it sit for an hour. Wash it out with shampoo and condition. Coconut milk is rich in proteins, essential fats, and potassium, all of which are needed for healthy hair. 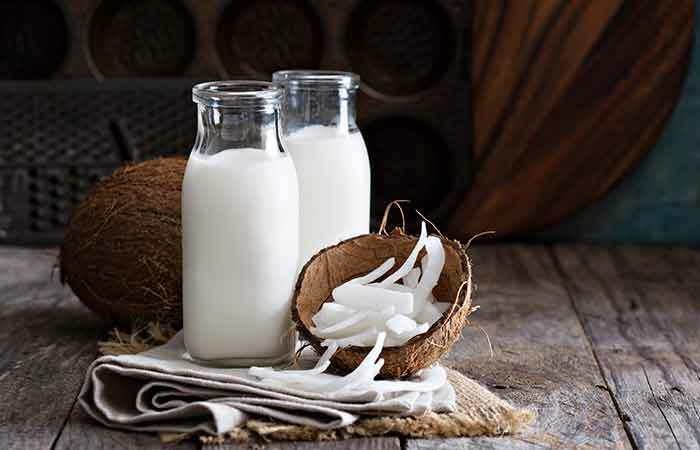 To use coconut milk for shiny hair, apply 1 cup of the milk to your hair and let it sit for 20 minutes. Rinse this out with cool water. This mineral is essential for the healthy skin, hair, and nails. A deficiency of this mineral can lead to problems such as hair loss, acne, and brittle nails. 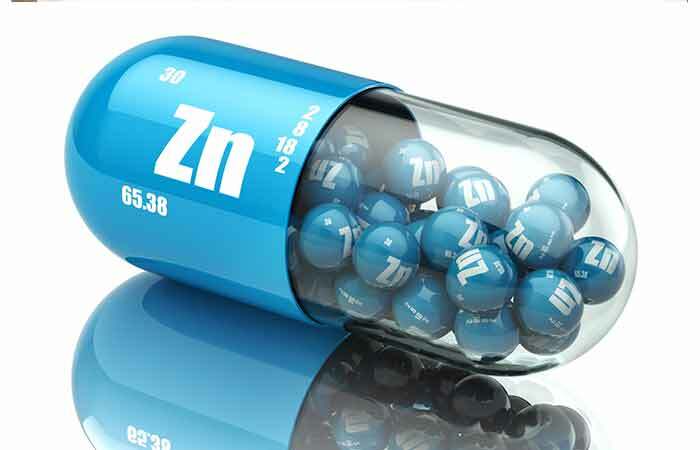 So, start loading up on foods like spinach, nuts, poultry, and beans, all of which are rich in zinc. 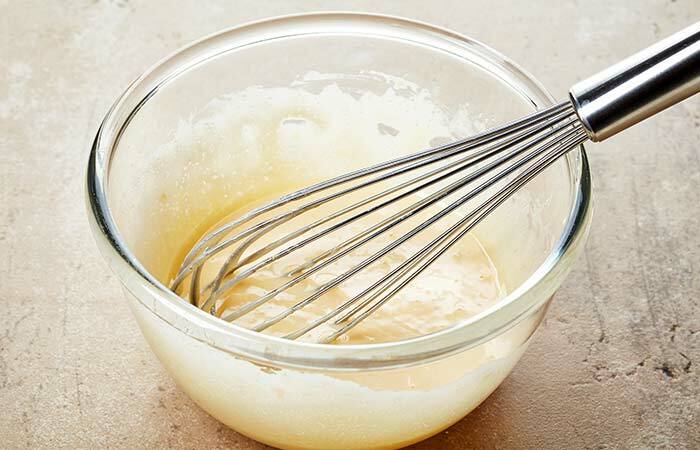 Full-fat mayonnaise contains the goodness of eggs, vinegar, and fatty oils that are amazing ingredients for hair care. 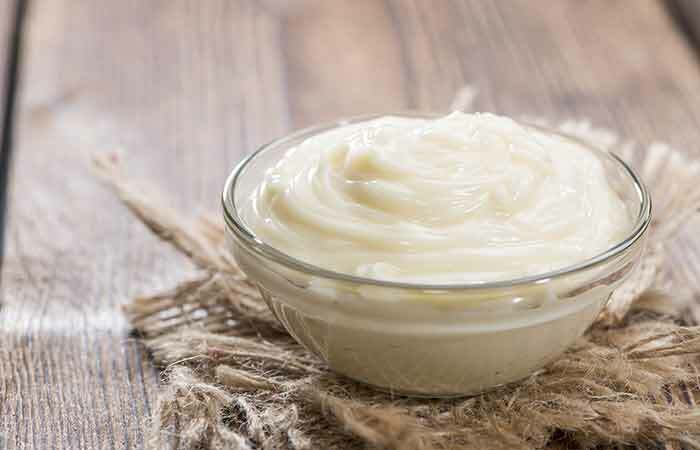 Use mayonnaise as a deep conditioning treatment by applying it to your hair. Ensure that the mayonnaise is at room temperature. Dampen your hair with warm water before you start the treatment. Let it sit in your hair for an hour and then wash it off with shampoo and conditioner. 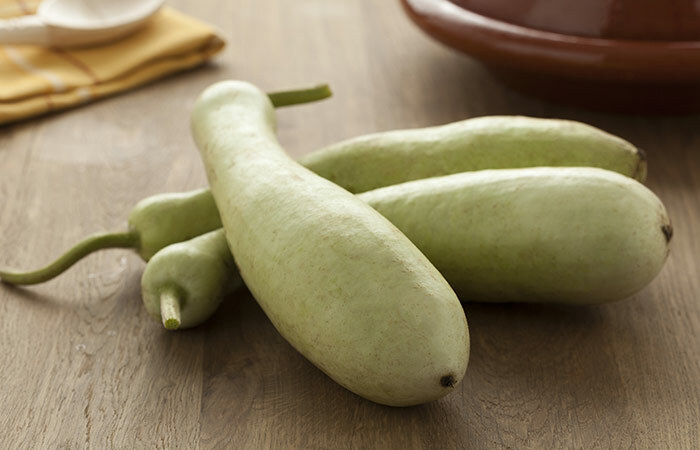 Bottle gourd is another amazing ingredient for attaining glossy locks. Peel a bottle gourd and extract the juice from it. Apply this juice to your hair and let it sit for 30 minutes to an hour. Wash off with shampoo and condition. 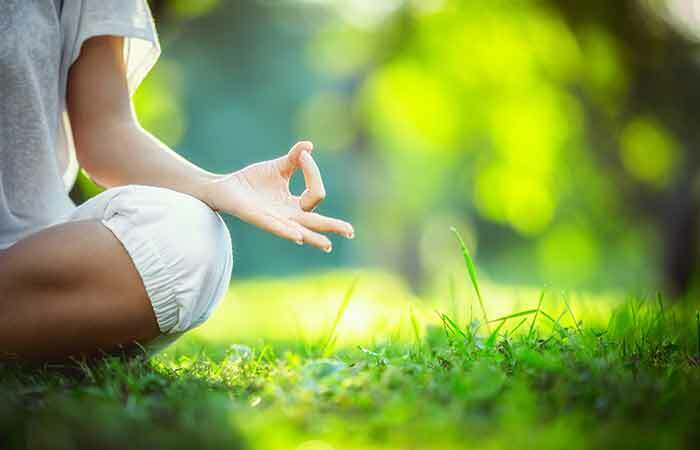 There are many yoga exercises that you can perform to achieve hair that is long and lustrous. It helps maintain the health of your hair by controlling stress, relaxing your body, and improving blood circulation. Taking vitamin supplements can make a great deal of a difference when you have a long-term goal of wanting long and lustrous hair. Certain vitamins like the B-complex vitamins, Vitamin C, and Vitamin E are essential for healthy hair growth. While you can eat foods that are rich in these vitamins, consuming vitamin supplements is also a viable option. However, be sure to consult a health care profession before you start taking any supplements. 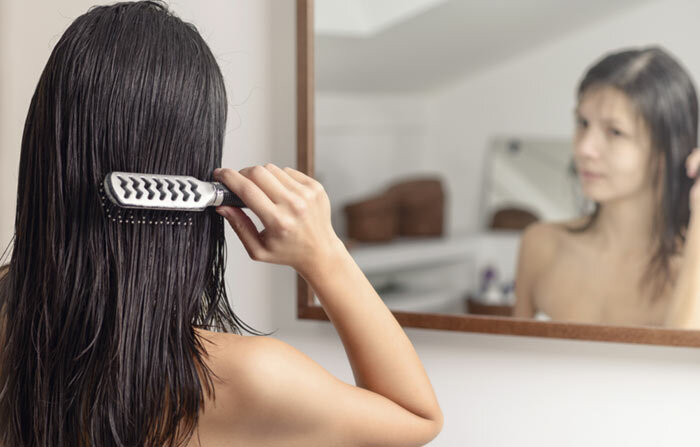 If attaining hair that is gorgeous and glossy is one of your long-term goals, maintaining the right diet for shiny hair becomes a necessary thing to do. 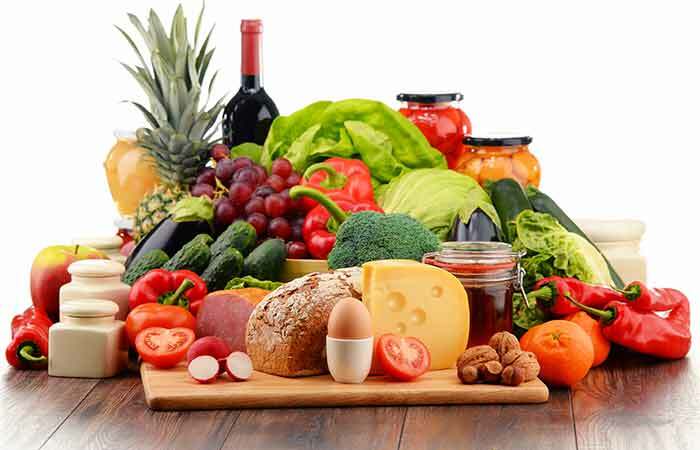 While maintaining a balanced diet that includes seafood, meat, and eggs, and drinking plenty of water are a given, loading up on foods that mainly boost the health of your hair is something that will lead to faster results. Following is a list of foods that you must include in your diet if your want hair that is smooth and lustrous. 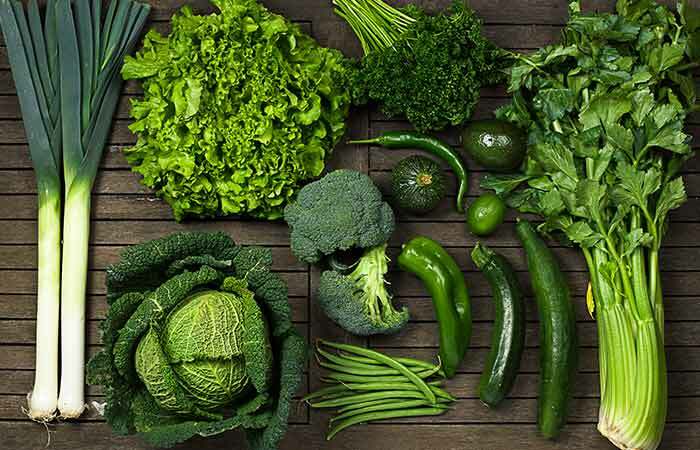 Vegetables that are dark green, like kale, broccoli, and spinach, must be a regular part of your diet. This is because they are rich in omega-3 acids, proteins, and essential minerals like potassium, zinc, selenium, iron, magnesium, and calcium, which improve the health of your hair and keep it nourished. 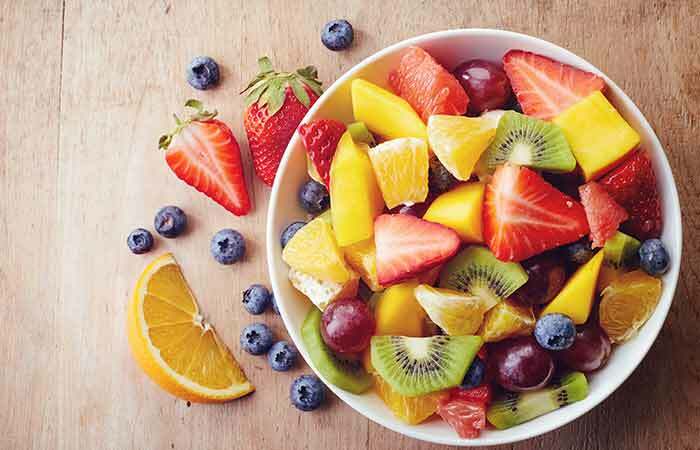 Fruits need to be an important part of your diet because of their rich vitamin and mineral content. Consuming fruits like bananas, avocados, cantaloupes, grapes, apples, lemons, tomatoes, and papayas will go a long way in improving the health of your hair. 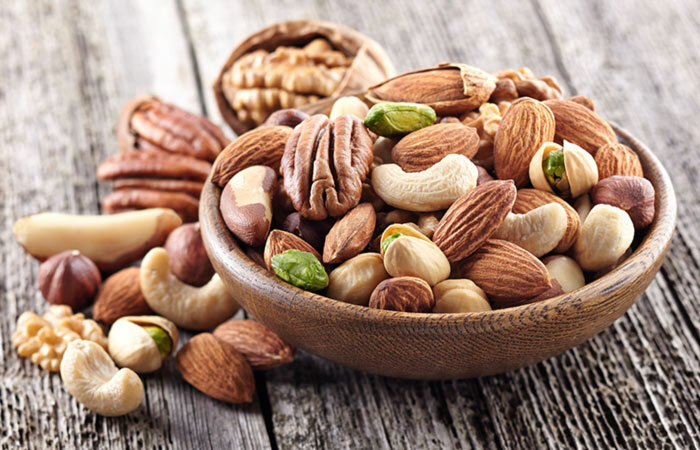 Nuts are a rich source of fatty acids and minerals like zinc. They are also a healthy snack option. Snack on a few nuts every day for hair that is glossy and glamorous. Stress is one of the biggest causes for unhealthy hair. It is also a huge stressor that leads to hair fall. Being too stressed can affect your blood circulation, minimizing the nourishment that your hair follicles receive. Stress-relieving activities like a relaxing head massage, yoga, and exercise will go a long way towards maintaining the health of your hair. Hard water is water that is rich in minerals like calcium, copper, and magnesium. 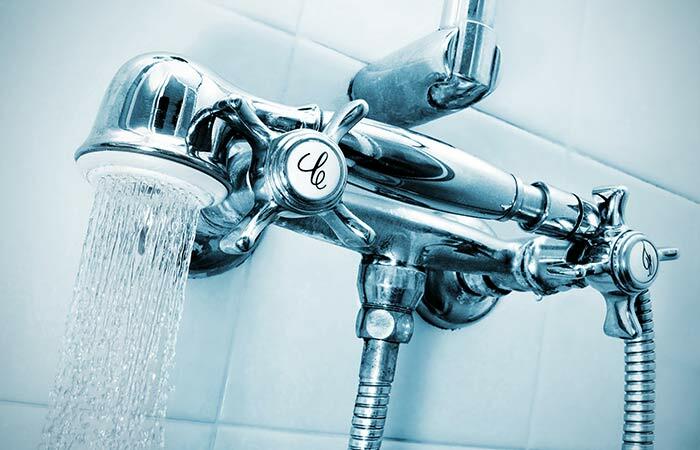 The excessive use of hard water can lead to brittle hair and hair loss in extreme cases. Using a shower filter can help solve this problem. 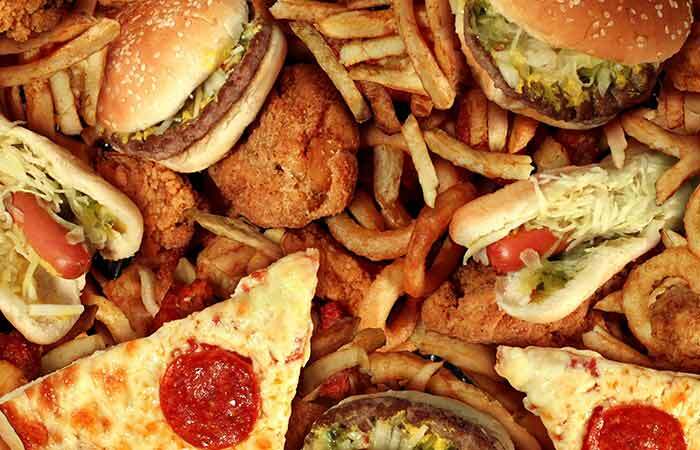 Avoid junk food, sodas, excessive sugar, alcohol, and white starch in your diet as these foods can lead to hair fall, dandruff, and brittle hair. While chemicals cannot altogether be avoided, steering clear of chemical treatments is necessary. Treatments like bleaching and permanent straightening make your hair porous and susceptible to damage. When choosing shampoos and conditioners, opt for brands that are free of sulfates. Sulfates can be damaging to your hair, and excessive use of them can lead to dry, brittle hair. Your hair is at its most vulnerable when it is wet; this is why you must never brush it while it is still damp. Leaving your hair wet for extended periods of time can damage your cuticles and make your hair porous. To avoid this, use a blow dryer on the cool setting to dry your hair after washing it. Allow your hair to dry completely before you put it up. Flat ironing your hair can be looked at as a short cut to getting glossy hair. 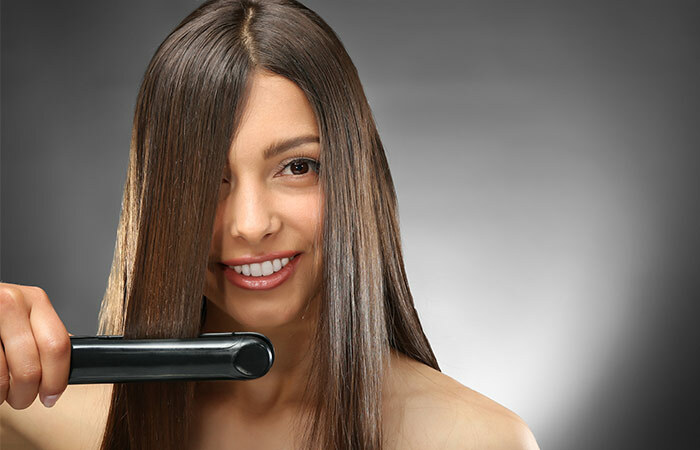 The straightener makes your cuticles lie flat, allowing more light to reflect off the surface of your hair. However, using a flat iron too often can damage your hair, and in some extreme cases, fry it. Prep your hair for flat ironing by oiling it the night before and applying a heat protectant before you straighten it. Your hair needs as much moisture as it does nourishment. Not using conditioner can leave your hair feeling damaged and dried out. Conditioning your hair seals your cuticles, locking the moisture in your hair shafts. It also coats your hair to instantly transform a dry and rough mess into smooth and shiny hair that a comb can effortlessly slide through. 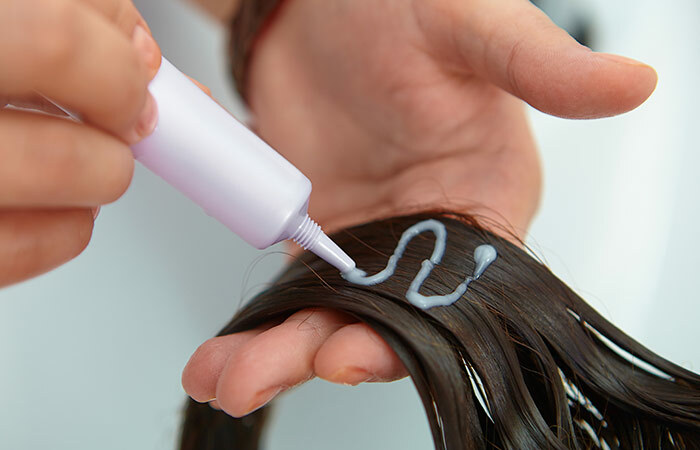 If you have oily hair, apply a small amount of conditioner from the mid-lengths of your hair to the tips. For dry hair, you can start from higher up. Drink at least two and a half liters of water every day to keep your hair hydrated and healthy. Add some water to your shampoo to minimize the drying effect it has on your hair. Put your hair up in a loose top knot before bed to keep it from tangling. It would also be a good idea to switch your pillow covers to satin ones, which will keep your hair from drying out while you sleep. Use a clarifying rinse like apple cider vinegar at least once every month to remove build up from your hair. Detangle and brush your hair before you shower so that your hair is more manageable while it is wet. Do not towel dry your hair as it causes dryness and damage. Instead, use a blow dryer on the cool setting to get the job done. Use a wide toothed wooden comb or a paddle brush for your hair. The wooden comb works best for detangling your hair and does not cause static. Do not wash your hair more than three times a week to keep it from drying out. Oil your hair twice a week to keep it healthy and shiny. 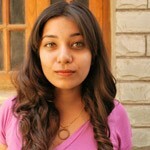 Maintaining the overall health of your hair is a sure shot way of attaining gorgeously glossy hair. From oiling your hair to nourishing it with ingredients that are readily available, there are multiple ways to achieve shiny hair. Now that you know how to get shiny hair, what are you waiting for? Pamper your hair with these amazing hair care recipes and tell us about your experiences in the comments section below. Who doesn't wish for long, silky and lustrous locks? Check out these effective natural ways to moisturize hair and your hair will be the one causing all the envy! !